Business and public sentiment towards Facebook and Google’s use of private, sensitive data is growing increasingly negative as they develop more products to harness and sell personal information for a profit. Through Piwik PRO, we help customers protect their data. 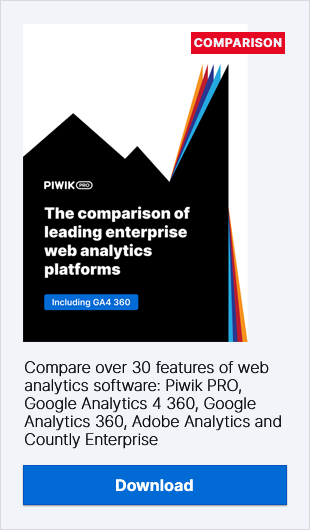 While Google Analytics is a popular, convenient tool for many companies and governments who want to analyse traffic on their website we’re providing an alternative that puts users in control. If you want to protect your digital privacy and you look for practical advice, read this blog post. The ad-free Ello, known as the anti-Facebook social network, is capitalising on public concern about how personal data is being used. When it went viral earlier this year, it was registering an astonishing 40,000 sign-up requests per hour. Ello’s dizzying rise and privacy-friendly appeal recently helped it secure $5.5m in funding. The internet as we know it has a very centralised structure, meaning that the majority of data flows through a small number of companies, such as Google, Facebook and Yahoo. With the risk of leaks, malicious hacks and intrusive pressure from spy agencies is at an all-time high, Diaspora is offering an alternative. It operates with no central base, with servers (called “pods”) all over the world containing users’ data. Google alone accounts for around 40% of all internet traffic, but alternatives are out there. DuckDuckGo is a search engine alternative that doesn’t collect IP addresses or track your searches. It exploded in popularity in 2013 following the revelations about NSA mass surveillance. Wickr is a surveillance-proof messaging app that promises users ‘military-grade’ encryption. Those concerned about privacy and reluctant to use Facebook Messenger or the Facebook-owned WhatsApp, use the Wickr app to send more than one million self-destructing, encrypted messages every day. The company recently raised $30m in funding. Google Drive is a popular cloud-based tool used by many businesses to share and collaborate on documents. However, companies like SpiderOak are tapping into appetite for applications with beefed-up privacy features. SpiderOak operates with a ‘Zero-Knowledge’ approach, meaning that the server never knows the plain text contents of the data it is storing. This means that data is never at risk of being compromised or abused by either internal threats or external hackers.